One of the largest banks in the United States of America, Wells Fargo is renowned for the quality of the financial services that it provides to individuals and business entities of every shape and size. On this site (www.wellsfargo.com) you will be able to learn more about all such services, using a really neat navigation menu that includes three main tabs: “Personal”, “Small Business” and “Commercial”. And the site also includes detailed information regarding loans and IRAs. Additionally, on Wellsfargo.com you can find the location of ATMs in just every single city in the US. This is done merely by supplying the ZIP Code and/or the name of the State you are in. Of course, there’s no need for me to tell you that it is possible to open a new account through the site. The process is quick and trouble-free, and it is started by choosing the kind of account that you want to have opened from a drop down menu. The account will be ready after filling out a couple of forms. 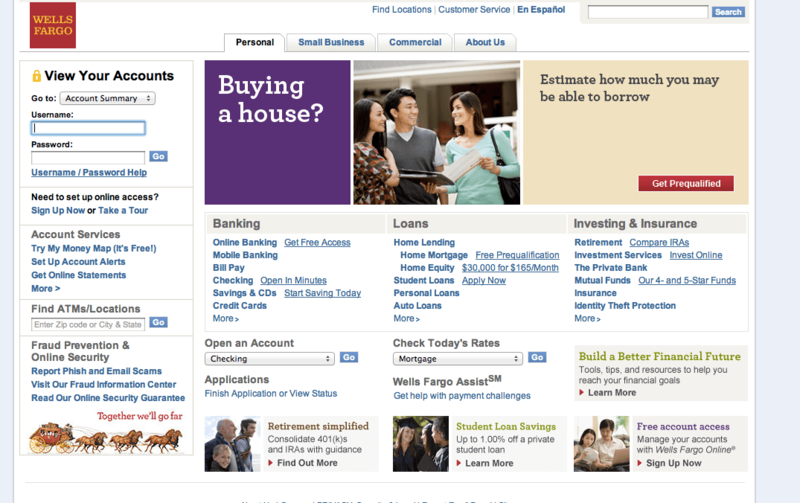 And a menu for checking today’s rates is likewise made available on Wellsfargo’s homepage. Besides just opening an account there, Wellsfargo.com offers online banking services where you are able to pay your bills, whether they are recurring or one-time payments. You can also make fund transfers or look at personalized charts of your “money map”, which will show if you are over your average expenses in a determined period and allow you to design your budget for the future. Through online banking you may also see images of your scanned checks once they have been cleared, a tool that will help you to have a really complete control of your finances. All these online tools are also available for mobile devices, from text message information delivered to you by sms to applications especially designed for your smart phone. Standing together with our customers and communities. Wells Fargo is one of the four largest banks in America. Lots of families count on in to safeguard their future. This website will let them keep a good watch on their accounts from wherever they are. Can accounts be cancelled through the site, too? Or all you can do is to create them?